One mind-blowing Headset delivers it all. Experience knockout next gen audio with an ultra-premium, super-stylish Headset. 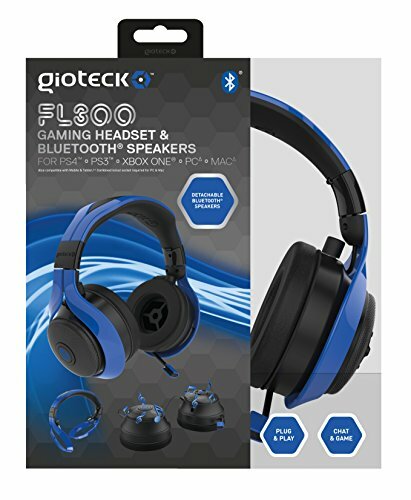 The FL300 Bluetooth Gaming Headset smashes listening through to the next level - with dual function detachable ear cups that can also be used as high quality detachable Bluetooth portable speakers. Just connect to any compatible device and the FL300 Bluetooth Gaming Headset is ready to rock some external sounds. Use Bluetooth compatible devices wirelessly. PS4 and Xbox One consoles require use of chat cable. Dual internal and external facing Speakers allow for use as separate Bluetooth speakers. If you have any questions about this product by Gioteck, contact us by completing and submitting the form below. If you are looking for a specif part number, please include it with your message.